Are your students having issues getting started writing an argumentative essay? Do they need help with hooks, transitional phrases, counterarguments, or conclusions? 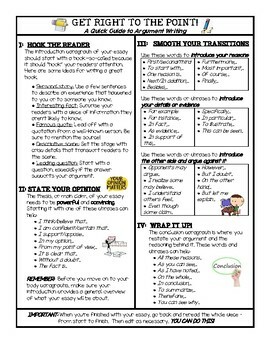 This one-page guide will help students as they use sources to write an essay. Just print it out, give it to students as a guide, and hopefully they will no longer need it during test time!